variety of EM and EMCW, produce little or no waste, and be cost-effective. The efficacy of rapid chemical destruction of explosives by MuniRem as a viable alternative to thermal destruction of explosives in different materials has been successfully demonstrated and validated on multiple field scale projects. The MuniRem powder is shipped in United States Department of Transportation approved containers via air, land or by sea. 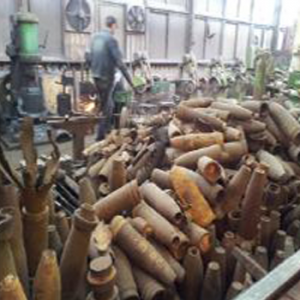 Decontamination of bomb casings and demilitarization scrap metal is achieved either by spraying MuniRem solution on large bomb casings or soaking the scrap metals (including bombs shells, bomb fragments, breached projectiles) in MuniRem baths. The decontamination occurs when the contaminated surface is soaked in high strength MuniRem solution (>15%) and allowed to react for 2 - 4 hours. MRE has developed standard operation protocols for decontamination of explosives contaminated scrap metal and other demilitarization wastes for self-performing clients. Our MuniRem solution is flexible and scalable with a “pay-asyou-go” model, requires NO material upfront costs. Typical MuniRem costs are 30-50% less than traditional for demilitarization methods. No air permits are required to apply MuniRem in support of demilitarization.